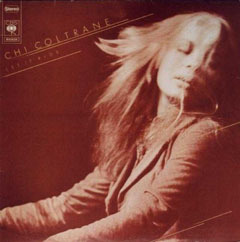 As she moved past “Thunder and Lightning,” the hit single everyone remembers, Chi Coltrane in 1973 gathered an all-star group of session players as she recorded “Let It Ride,” her second LP for Columbia. Merry Clayton and Clydie King were among the backing singers, Jim Gordon and Jim Keltner among the drummers, Klaus Voorman and Emory Gordy among the bass players, and Lee Ritenour and Larry Byrom, who’d just left Steppenwolf, among the guitarists. The horn section consisted of Jim Horn, Jim Price and Bobby Keys. It didn’t get much better than that. All that talent, led by Coltrane singing and playing the piano with a rare combination of elegance and thunderous force. She wrote all but one of the 10 songs, arranged all 10 and produced the record. A remarkable accomplishment for someone just 24 at the time. “Who Ever Told You,” “Myself To You,” “It’s Not Easy,” “Feather My Bed” and “Forget Love,” Chi Coltrane, from “Let It Ride,” 1973. This is Side 2. It runs 16:58. The LP is out of print, though some of the songs are available from Coltrane’s website, either digitally or on CD. This side shows Coltrane’s considerable range. “Who Ever Told You” and “It’s Not Easy” are gospel-flavored rave-ups. “Feather My Bed” is a little bit of roadhouse swing. “Myself To You” and “Forget Love” are love songs, the former fairly standard pop and the latter chock full of high drama, almost a classical piece. “Let It Ride” was recorded in part at Mama Jo’s Recording Studio (now revived as Dave’s Room) in North Hollywood, California. Coltrane, who was born in Wisconsin and learned her craft in the clubs of Chicago, settled not far away. The year after this LP came out, she bought a home in the Hollywood Hills. Over the last 40 years, her neighbors in Bronson Canyon have included Chuck Berry, Robert Redford, Chick Corea and Madonna. The guy who used to live next door? That was Axl Rose. You rarely see Chi Coltrane records while digging. The deeply spiritual Coltrane wasn’t into promoting herself or her records. After “Let It Ride,” she recorded sporadically and is said to have struggled financially after being mismanaged. In 1977, she moved to Europe, where she found a more passionate following and released several records. Her last LP of new material was “The Message” in 1986. She returned to Los Angeles in 1993, where she is said to have built a recording studio and done social work. Coltrane, now 64, resumed performing four years ago, mostly in Europe, where she remains popular. Her most recent release is a live recording of her 2009 comeback concert in Vienna, where she’s said to have played before a crowd of 100,000 people. Her first song that night is the first song emerging through the sweet blue haze of time on The Midnight Tracker tonight.